True fans of the Winter Olympics will need more than a television broadcast schedule to stay current, especially if NBC's Olympics coverage (across local and cable channels) doesn't show your favorite sports or shows them on a tape-delayed broadcast that leaves you 3 hours behind your Twitter feed. Fortunately, we have some tips to help you use your PC and smartphone to get the coverage you need--regardless of where in the world the right coverage may air. 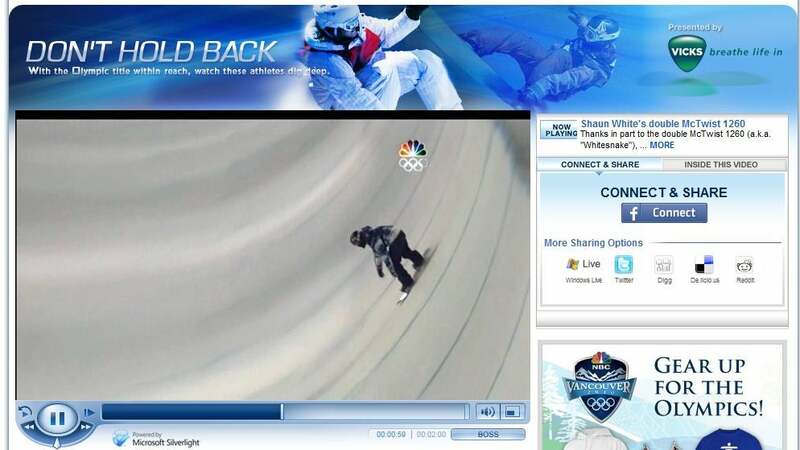 NBC's 2010 Winter Olympic streaming player includes a BOSS button. NBC has the U.S. broadcast rights to the 2010 Winter Olympics, so the best place for U.S. viewers to start looking for coverage is at the NBCOlympics.com Web site. (We previously covered the network's streaming options for the 2008 Beijing Summer Olympics.) Prepare your PC by ensuring that it has the most recent versions of the Adobe Flash and Microsoft Silverlight plug-ins; you'll need them to view the slideshows and to stream video. If you don't mind following NBC's online streaming schedule, it offers a fairly good way to watch the Olympics. NBC even provides a BOSS button that brings up a generic Windows desktop--complete with empty spreadsheet--in case you want to view the events discreetly while at work. The NBCOlympics Website has plenty of other gizmos besides streaming video to keep you coming back. For example, you can choose among many Olympics RSS feeds organized by topic, sport, country, or nation, opt for alerts via SMS or e-mail, and get local Olympic TV listings sorted by provider. If you have a smartphone, you can supplement your PC coverage with upcoming apps for the iPhone or BlackBerry. A mobile-optimized version of the NBCOlympics site will be available, as will live streaming video via Olympics 2Go. If you live outside the United States, you won't be able to stream video from NBC without using a workaround, since NBC's broadcast rights don't extend beyond the United States. To watch from another country, you'll need a proxy server or virtual private network (VPN) that is based in the United States and can trick the site into thinking that you're there, too. Unfortunately, most free proxy servers are designed for simple Web browsing and can't handle streaming video. Instead, try Hotspot Shield by AnchorFree (warning: it's anyone's guess as to how their servers will handle a deluge of Olympic traffic). At this writing, it's unclear whether mobile streaming options will be similarly region-locked; if they are, the iPhone version of Hotspot Shield might help. If you turn your nose up at Yankee-centric Olympics coverage (too much fluff, not enough international competition), consider seeking out an international broadcast feed from another country. Unfortunately, just as U.S. fans abroad can have trouble picking up NBC's coverage, broadcast rights issues can prevent a viewer inside the United States from watching, say, a BBC broadcast. Among the best international streaming options are Canada's domestic coverage from CTVOlympics.ca (in English) and RDSolympiques.ca (in French), both of which will host up to 14 live streams from Canadian TV networks as well as providing live coverage of every sport from start to finish. Meanwhile, the BBC will offer live BBC Two coverage streams and four Web-only streams via the BBC Sport Web site and mobile streaming via BBC Mobile. Viewers in the United States won't be able to watch any of the Canadian or British streams without a little effort, however. That's because the BBC and CTV, like NBC, have contracted with the International Olympics Committee for broadcast rights to specific geographical regions only. To watch direct-from-the-source international streams, you may have to do some googling for a VPN service located in your country of choice. Some free (usually ad-supported) VPN services exist--TheFreeVPN.com, for example, has a free Canadian VPN server, but it's capped at 250 users--but you're likely to have better luck with a paid service, since they typically offer higher bandwidth and a more stable connection. Once you've logged into the VPN, you should be able to access the desired Website normally, though you may notice a bit more delay than usual because data traffic has to jump through a few extra hoops. Paid VPN services typically range in cost from $5 to $15 per month; some services have free trials, day passes, and other offers that permit you to test the service before committing to a full month of it. Also, make sure that the VPN service doesn't impose a bandwidth limit; many such services offer unlimited bandwidth for a reasonable price, but some put a cap on usage--and you may exceed that cap quickly with streaming video.